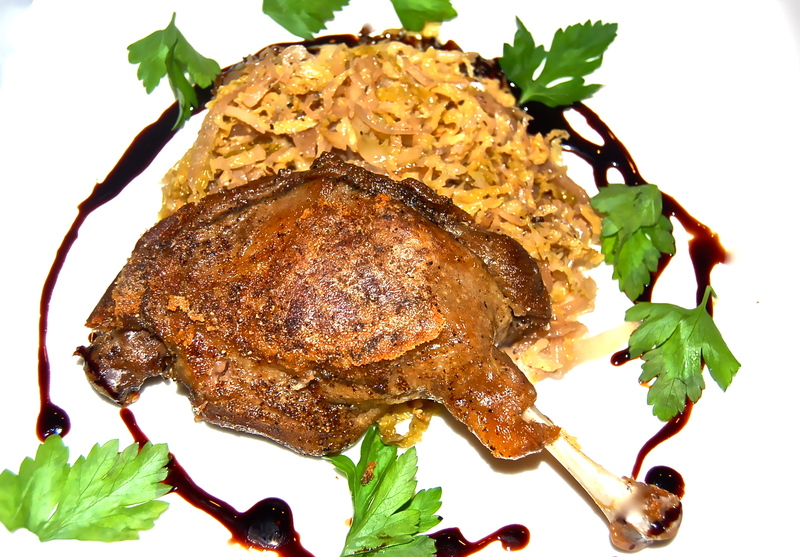 How convenient to be able to purchase Confit of Duck pre-prepared six to a package. Then with my faithful FoodSaver, vacuum them, two to a bag. What a pleasure to decide on serving this delightful entree and simply reaching for it in the freezer. It turns an ordinary weeknight dinner into something special. Once again, my thanks goes to Fred Brill of Adams for fulfilling my request. The Wine-Braised Savoy Cabbage completed the plate. 1. Cut the Cabbage in quarters & remove core. Use a mandoline to thinly slice the Cabbage quarters. Place the shredded Cabbage into a large bowl. 2. Heat the Butter & Oil over medium-high heat in a Dutch oven or a large pot. Add the Onion & sauté until softened, about 2 minutes. Add the Cabbage & sauté until it’s coated with the Oil. Season with Salt & Pepper, then add the Bay Leaf, Cloves & Allspice. 3. Pour in the Wine, Wine Vinegar & sprinkle in the Sugar. Bring to a boil, stirring occasionally. Turn the heat to low, cover & cook for 40 minutes or until tender. Taste for seasoning. 4. Preheat the oven to 450 F.
5. Heat a cast iron skillet over medium-high heat. Add the Duck Legs skin-side down & cook for 1 minute. Turn them to their meat side, place the skillet in the oven & bake the legs for 10 minutes. They should be hot & richly colored.